There is a feeling of euphoria surrounding each franchise following the NBA Draft. That feeling will then turn into expectations as each team will want their players to be remembered as draft gems. Clarity and a sense of direction came about for some teams, players, or fans while frustration and anxiety crept in for others. It is the offseason, but wins and losses still can be given out. The final results of the draft dubbed some teams or players as both winners and losers. The winners are the teams or players that benefited the most from what happened during draft night. On the other hand, the losers might not realize the position they are now in. 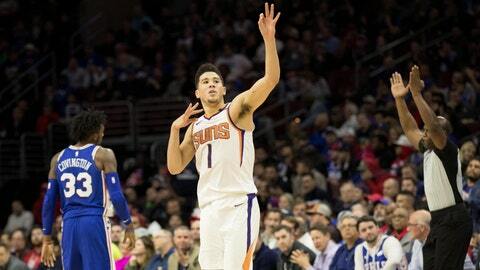 The Phoenix Suns have been in the cellar of the NBA since they drafted Booker in 2015. They have went 68-178 despite the Kentucky alum averaging 19.8 points during that span. He is clearly their franchise cornerstone and they did a good job adding some pieces in the draft to compliment what he brings to the equation. The Suns took Deandre Ayton with the first overall pick and that had to excite the slashing 6’6 guard. The pick-and-rolls/pops might already have fans salivating like it is lunchtime. Phoenix finished dead last in three-point shooting as they shot 33.4 percent. They could not hit the ocean with a rock if they wanted to. Also, they needed to add another defender or find a way to clone Josh Jackson. The Suns brass drafted Zhaire Smith and traded him for Mikal Bridges. Bridges fits exactly what they need as a 3-and-d connoisseur. Booker now has some weapons around him and should be a happy camper in the desert. Things appeared to be bleak for the Mavs when the Atlanta Hawks took Luka Doncic until the two parties agreed to a deal that would send him to Dallas for Trae Young. Dallas appears to have their next star in the 19-year-old. Doncic, per 36 minutes, averaged 20.9 points, 7.5 rebounds, 6.6 assists, and 1.6 steals. Those numbers are why he is believed to project nicely to the NBA. Dirk Nowitzki now has the chance to pass the torch to him. In addition, Dallas has a dynamic backcourt featuring Doncic and last year’s lottery selection in Dennis Smith Jr. These two should be the perfect supplement to one another. Smith is an athletic, attacking guard while Doncic is a smooth scorer. Sharing the ball will be key as well as how they matchup against other teams defensively. The selection of Jalen Brunson in the second round is an underrated move too. Brunson brings a steady presence to both ends of the court at point guard. He could see big minutes in a backup role. The Mavericks are trending in the right direction. The Clippers are slowly but surely building a new image after being known as “Lob City”. They did a good job in moving along the process as they put their back-to-back lottery picks (no. 12 and 13) to good use. First, they had to draft Miles Bridges then trade him to get Shai Gilgeous-Alexander. Gilgeous-Alexander is a 6’6 point guard that has the ability to attack the rim and fill up the stat sheet. His jumper should improve as he now has endless amounts of hours to work on it as school no longer is a priority. He fared well with the other two point guards drafted ahead of him, Young and Collin Sexton in terms of advanced numbers. SGA’s 28.8 assist percentage and 5.2 win shares were only second to Young in those departments. His defensive win shares, 1.9, and defensive box score plus/minus, 3.6, were exponentially higher. In other words, Gilgeous-Alexander is the better defender. He only had the ball in his hands 21.9 percent of the time and that was the lowest of all three guards. All in all, the Clippers got a late blooming prospect with oodles of potential. Jerome Robinson, the other lottery selection, is a source of instant offense as he averaged 20.7 points at Boston College last year. He is another attacking guard with the ability to drain shots from deep. Robinson is literally a 6’5 version of Lou Williams. The Clippers wanted to get younger while improving their roster and they did just that. With the Orlando Magic picking Mo Bamba, Vucevic could be faced with two scenarios. He could become a bench player, at some point, or get traded. The latter is more likely as he is set to make 12.7 million this upcoming season. Vuc tried to re-invent himself as a passing threat and hit a career-high 64 threes in addition to his low post game. The problem for the former USC Trojan is the new NBA does not value lumbering, back-to-the-basket bigs that do not offer resistance at the rim. Most teams elect to turn players like him into super subs. Enes Kanter and Greg Monroe are the poster boys of that new role although Kanter benefitted from the New York Knicks benching Joakim Noah. Vucevic, starter or not, offers scoring, rebounding, dime-dropping, and, now, the ability to spread the floor. The Sixers may regret not drafting Jayson Tatum in last year’s draft as his scoring and defensive prowess was something to marvel at as a rookie. Bridges of Villanova offered the shooting resourcefulness as well as the pesky defense of Tatum. It was a match made in heaven for both sides as the Sixers could get the shooting they need while Bridges could play for the team he grew up loving. Not to mention, he could have been part of the organization that employs his mother. That is the kind of stuff Rob Minkoff, director of Lion King and other kids movies, could only hope to create. Well, Bridges learned that the NBA is a business and not some heartfelt motion picture. The Sixers drafted the two-time national champion with the 10th pick only to deal him away to the Suns for the aforementioned Smith and a future first rounder. Smith does not offer the shooting aptness of Bridges as he only clogs the lane even more for Joel Embiid and Ben Simmons. Things went from a Minkoff to M. Night Shyamalan horror film for both Philly and Bridges. The Sacramento Kings cashed in on Marvin Bagley III and that means someone’s cash flow is in jeopardy as the Kings are crowded with big men. The 2016 first round pick in Labissiere has been given every opportunity to show that he is the man to start at power forward next to Willie Cauley-Stein. He was supposed to be one of the biggest beneficiaries to DeMarcus Cousins being dealt to New Orleans in 2017. The Haitian big man is averaging 8.7 points and just 4.8 rebounds during his two years in California’s capital. The addition of Bagley creates a feeling in which Labissiere is feeling a pit in the bottom of his stomach. That is never a good feeling. Overall, the excitement of the NBA’s offseason is barely kicking off as the real fun begins in July. The draft was merely an appetizer to the main course that is free agency.